NORTH CANTON, Ohio — Visitors to the 2014 National Business Aviation Association Convention Exhibition in Orlando, Fla., Oct.21-23, will see an extensive offering in bearing repair services and high-quality, FAA-approved parts at The Timken Company (NYSE: TKR; www.timken.com) booth No. 3028. Timken has a wide range of FAA-approved replacement parts and inspects and reconditions more than 30,000 main engine, gearbox and APU bearings each year, on more than 80 different platforms. "Our strength in technology fuels our ability to provide superior value through proven performance and ready availability," said Larry Shiembob, director of Timken Aerospace Aftermarket. With more than 200 bearings added to its capabilities list each year, the continually expanding Timken bearing repair offering can match almost any need. Turnaround time is among the industry's best, as well, averaging just 10 days from receipt to shipment. "We've been serving the global aerospace market for 55 years," Shiembob said. "Our state-of-the-art bearing repair facility in Los Alamitos, Calif., is known for efficiency, reliability and speed. We create significant value for our customers in terms of quality, warranty and delivery." Timken has obtained most of its 1,600 FAA-approved PMAs through test and computation – the most rigorous process that the FAA certifies. Customers recognize the value Timken creates for them. "Demand for our turbine blades for the PT6A -27/28 series has doubled this year," noted Brian Miller, Aerospace Aftermarket sales manager. "2014 is also shaping up to be a record year for sales of Bell medium helicopter replacement parts, from main rotor grips to strap fittings and various gears and shafts." Timken supplies most of the parts that drive overhaul cost, including turbine and compressor blades, compressor wheels, combustion liners, nozzles, bearings, gears and more. Re-introduced in 2013, Timken PT6 reduction gears have so far passed their first inspection period of 500 hours. They feature an enhanced superfinish that supports oil film thickness, helping to improve durability. The company has sold approximately 40 sets of gears so far. "Our expertise spans technology development, engineering, manufacturing, repair and fleet support," concluded Shiembob. "We collaborate with our customers throughout the entire life cycle of their aircraft. With us, they get high-quality, FAA-approved parts at competitive prices." Visitors to Timken NBAA Booth No. 3028 also have the opportunity to enter a daily drawing for a free Apple® iPad Mini. The Timken Company (NYSE: TKR; www.timken.com) engineers, manufactures and markets Timken® bearings, transmissions, gearboxes, chain, and related products, and offers a spectrum of power system rebuild and repair services around the world. 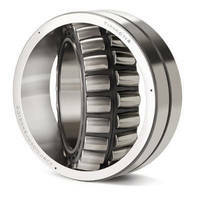 The leading authority on tapered roller bearings, Timken today applies its deep knowledge of metallurgy, tribology and power transmission across the broad spectrum of bearings and related systems to improve the reliability and efficiency of machinery and equipment all around the world. Known for its quality products and collaborative technical sales model, Timken posted $3 billion in sales in 2013 (excluding Steel business sales.) With approximately 17,000 people operating from 28 countries, Timken makes the world more productive and keeps industry in motion. Precision Planetary Gear has hollow shaft structure. Rotary AC Servo Actuator helps simplify equipment designs.